All Martians are trained and prepared for war from an early age - theirs is a society dominated by the military. 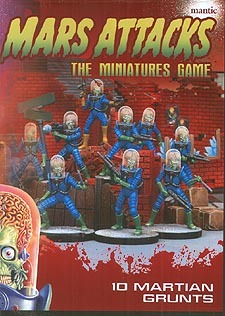 At the forefront of any Martian Invasion are the Grunts. Armed with Disintegration Rifles and Freeze Rays, they cut a distinctive figure in their Martian body armour and unmistakeable dome helmets. As ruthless as they are terrifying, it is an unfortunate enemy which underestimates them on the battlefield.